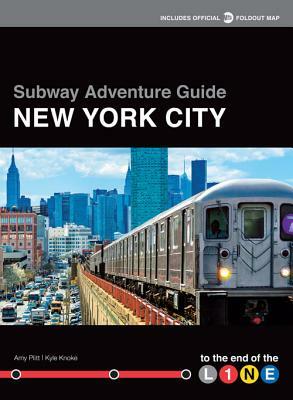 In Subway Adventure Guide: New York City, residents and tourists alike gain access to off-the-beaten-path adventures in a compact guidebook format and see the New York City that's not featured on postcards sold all over Manhattan. Each of the roughly three dozen end-of-the-line destinations spread out over New York City's five boroughs included in this easy-to-use guide, from restaurants and bars to landmarks and museums, are highlighted in great detail by authors Kyle Knoke and Amy Plitt—what to order, what to see, and how to get there. For even better exploring, each destination is organized by the more than 30 subway lines that run through the city, including handy maps with street names. From delighting in a little-known ethnic restaurant to admiring a local landmark, each adventure contained in this photo-packed pocket guide reveals a new hidden gem of the city. Van Cortlandt Park. Far Rockaway. Bay Ridge. Flatbush Avenue. Subway Adventure Guide: New York City takes you away from the tourist traps and closer to a genuine New York City experience. Kyle Knoke spent several years with Kimberly-Clark Corporation serving as an account executive on various global brands before launching Allen/James Design, a full-service virtual design and communications agency. He also owned and curated Allen/Thomas Gallery—a contemporary exhibition space featuring regional and internationally emerging artists. He divides his time between New York, London, and Appleton, Wisconsin. Amy Plitt is a writer and editor whose work has appeared in Bust, Condé Nast Traveler, Foam, Mental Floss, and Rolling Stone, among others. She covered New York City news and culture for more than five years as a staff editor for Time Out New York. She lives in Brooklyn.